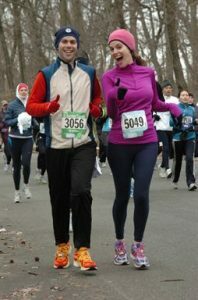 For the next two weeks SPEAR is spotlighting our patients who are running this year’s ING NYC Marathon on November 3rd. Today’s installment features husband and wife runners Adam and Elizabeth Brill, both patients of Jason Kang, PT DPT at our 16th Street facility. Adam: Running makes me feel free. Just a pair of sneakers and I’m on my way. It’s my favorite way to explore new places. I also run because I love food, and there’s nothing more satisfying than cooking and eating a meal with your lungs still burning from a hard workout. Running is a great way to stay in shape and learn about yourself and your surroundings. Elizabeth: I was never that into sports – and definitely not into running – but I started running when we moved to New York six years ago. It was a great way to get to know the City and spend more time outside. (I also didn’t have to pay for a gym membership.) I kept running because I loved it. 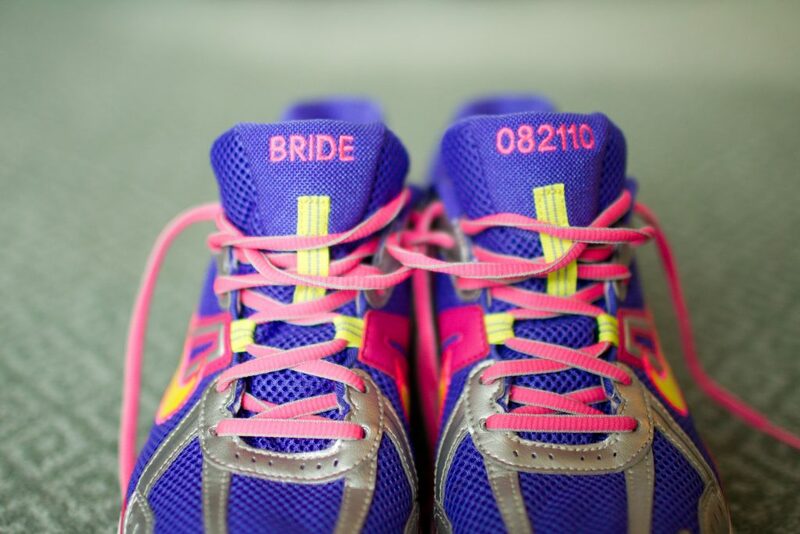 I was training for my first half marathon when we got engaged – Adam designed these “bride” sneakers for me with our wedding date – by far the best running gear/pair of shoes I’ve ever owned! How long have you been running marathons? Adam: The 2013 race will be the fourth race I’ve trained for, and the third one I’ve run. 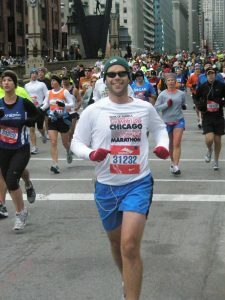 I finished NYC in 2008, Chicago in 2009, and then got “Sandy’d” in 2012. I think I’ll always wear that asterisk. Elizabeth: This will be the second marathon that I’ve trained for, but the first one I’ll actually get to run because of Hurricane Sandy. Since I started training for the 2012 race last spring, I’ve run more than 1,300 miles or roughly the distance from New York to Florida. Which physical therapist do you see at SPEAR and what treatments have you been doing for training? Adam: I work with Jason, and he’s been an integral part of my training. My IT band has been a trouble spot for me throughout the years, but with Jason’s help, I’m able to run with more confidence. We do exercises to strengthen and stretch my glutes, quads and hamstrings as well as massage to loosen my IT band. Elizabeth: I also work with Jason, and the experience has helped me improve both physically and mentally. I first started coming to SPEAR to get some knots in my legs worked out. At my first appointment, Jason put me in front of the mirror and asked me to do a one-legged squat. Looking at my reflection, I was shocked by how little strength and control I had to keep my knee from caving inwards. I thought I was doing enough by covering the long distances, practicing on hills and doing interval work, but Jason showed me how to train smarter. Since that first appointment, I’ve worked on strengthening my glutes and quads, stretching out my hamstrings and have also had Jason work on the knots in my muscles. I know that I am physically stronger than I was this time last year, and that gives me the confidence to be mentally stronger, too. Jason and the SPEAR team have been all-around fantastic, and I know I’m as prepared as I can be to face whatever the marathon throws my way. Runaway bride? Elizabeth’s “Bride” running shoes, designed for her by then-fiancé Adam. Do you have any words of wisdom or training tips for anyone thinking about doing their first marathon? Adam: Go for it. If you’ve thought about doing one, chances are you’re the type of person who has the tenacity and commitment to realize your goal. Before I started training for my first race, I had never run more than five or six miles. You learn a lot about yourself, and it’s a great sport. And as race day approaches, don’t over think it. Trust your training! Elizabeth: It is an amazing experience – and you should do it! Be committed but have fun. Listen to and take care of your body. Ask for help before you need it. Eat dessert. It’s OK to get nervous, but don’t let yourself or anyone else talk you into thinking that you can’t do it. You will be astonished by what you can achieve.